Last year, Martin Hatcher and his family opened a business that was the first of its kind in the Jonesboro community. Popcorn Parlor offers an array of unique popcorn flavors and candies, making it a one-stop shop for all things sweet and savory this holiday season. 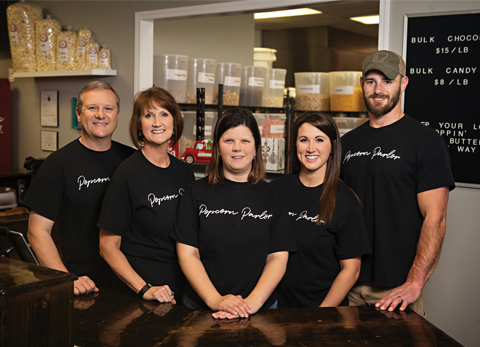 Martin Hatcher, along with his wife, Tracy, their daughters, Danielle and Kourtney, and Kourtney’s husband, Dustin Cook, visited a popcorn business in Shreveport, La., and quickly fell in love with the business’ concept. The family thought that a business of the same nature would thrive in Jonesboro’s growing food scene, and the rest was history. Upon walking into Popcorn Parlor, customers will quickly notice the collection of popcorn and candies that surround them, adding a sense of nostalgia to the parlor. The smell of freshly-popped popcorn adds to the experience. The parlor offers more than 55 flavors of handmade popcorn per day, including multiple categories such as Original, Savory, Kettle, Caramel Plus, Tutti Frutti, Specialty and Premixed Assortment. Whether a guest is craving something sweet or savory, the owners of Popcorn Parlor makes it their mission to satisfy every guest’s taste buds with their popcorn selection. Other popular options include Caramel Toffee Almond, Jalapeno Cheddar, Extra Buttery Caramel, a Rainbow-Mixture of all fruit flavors and Birthday Cake. Since the business is not a part of a franchise, each member of the family gets to pick and choose what flavors are sold in-store. Kourtney also enjoys how the family gets the opportunity to create and sell its own popcorn concoctions. Guests can choose from several sizes of bags, including mini, junior, small, medium, large or extra-large. Popcorn Parlor also offers the option of a metal tin to put the popcorn in, making it gift-ready upon leaving the store. Since opening, Popcorn Parlor has gained an impressive following in the Jonesboro community. 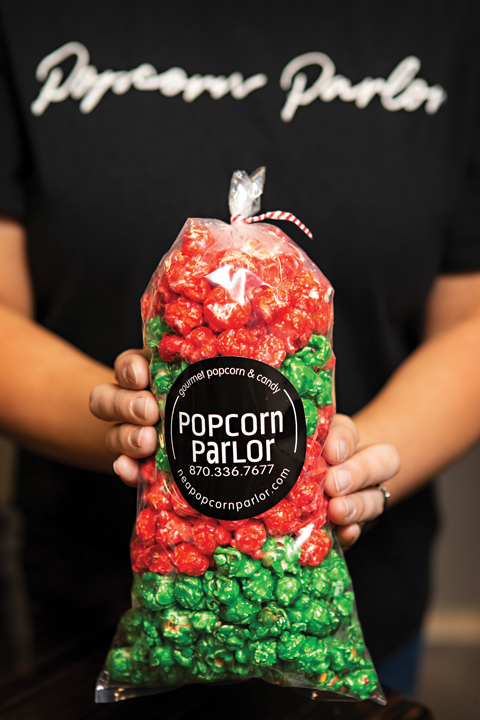 Whether guests are looking for a customized party favor, festive gift or even just a quick snack, Popcorn Parlor continues to exceed its customers’ expectations. What is the most rewarding part of owning Popcorn Parlor? Martin: We enjoy meeting new people and ensuring customer satisfaction, as well as seeing returning customers. What would you recommend someone try on their first visit to Popcorn Parlor? Kourtney: Because we have so many options to choose from, we always ask what they’re looking for in a flavor. Is it something sweet, spicy, caramel, fruity or chocolate – then we know where to start with suggesting samples. What else do you sell in-store other than popcorn? Kourtney: We have self-serve gourmet chocolates and candies that you purchase per weight. There are a variety of gourmet chocolates that include truffles, caramels, bridge mix and even a few sugar-free options. Our most popular chocolate is the oversized pecan turtles. Our candies include saltwater taffy, gummy bears and worms, sour Jelly Belly (jelly beans) and sugar-free gummy worms. We offer a variety of gift boxes for different occasions, gift certificates and, of course, the traditional popcorn tins in four different sizes. What services does Popcorn Parlor offer to its customers? Kourtney: We have been asked to participate in local events such as grand openings, The Bridal Expo and even Dillard’s VIP customer appreciation event. We have catered wedding receptions, baby showers and birthday parties. We have even hosted an in-store birthday party for a customer’s daughter. We also have a corporate account option for those sales representatives looking for something unique and easy to transport. Are there any plans to add more menu items in the future? Kourtney: We are always looking for new and unique items to sell. We have explored the possibility of offering a variety of chocolate fudges in the future that would be made fresh on-site. We also enjoy hearing our customers make suggestions on flavors they would like to try for a monthly special. Some of the popcorn flavors we have tried in the past months have been Pumpkin Spice, Dr. Pepper, Chili Lime, BBQ, Taco, Spicy Crawfish and Cheeseburger. What is something about Popcorn Parlor that the public might not know? Kourtney: The Popcorn Parlor is locally owned and is not a franchise. All popcorn is popped fresh and flavored on-site. Where do you see Popcorn Parlor in the future? Martin: We hope to expand by building relationships with more corporate accounts. We also would like to promote the thought of popcorn not being just a holiday gift item or treat, but a year-round option for showing your appreciation to those who make a difference in your life; for example, employees, teachers, friends, etc.